Aluminum reached a three-week high in London on speculation supply of the lightweight metal will run short of demand. Copper headed for a third weekly climb as available supplies shrank further. 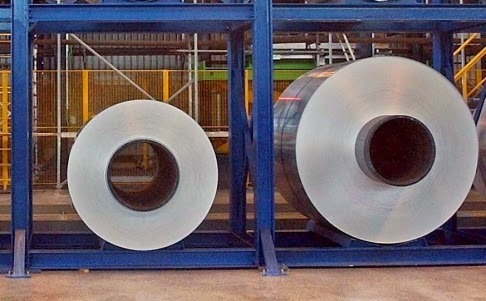 The aluminum market will be in deficit this year by 1.3 million metric tons, leading global producer United Co. Rusal said today. China’s imports of bauxite, used to make the metal, dropped 14 percent in April, customs data showed this week. There were no shipments from Indonesia, China’s main supplier in 2013, which banned raw-ore exports in January of this year. Aluminum for delivery in three months added 1.3 percent to $1,819 a ton by 12:43 p.m. on the London Metal Exchange after touching $1,824, the highest since April 29. Copper was set for the longest weekly winning streak since February after inventories available for removal from LME warehouses fell below 100,000 tons for the first time since 2008. Stockpiles total 175,850 tons, of which 92,650 tons is available for delivery, according to daily data. The remainder is earmarked for removal. The metal for delivery in three months gained 0.6 percent to $6,915 a ton on the LME, leaving prices up 0.8 percent this week. Copper for immediate delivery traded at an $80-a-ton premium to the three-month contract, indicating limited supply. The metal for delivery in July on the Comex inNew York rose 0.7 percent to $3.164 a pound. “Copper remains supported above $6,850 by lower stockpiles and higher premiums for immediate deliveries,” RBC Capital Markets LLC said in a note. Disrupted output at LS-Nikko Copper Inc. also aided copper, said Chae Un Soo, a metals trader at Korea Exchange Bank Futures Co. in Seoul. The company was ordered to halt operations at a smelter after a fire broke out yesterday. Operations at another smelter remain suspended after a blast on May 13. Tin, lead and zinc climbed in London. Nickel fell.